There was pretty much no way I wasn't going to see Lawless, the new film from director John Hillcoat (The Proposition, The Road) and writer Nick Cave (of "and" The Bad Seeds, The Dirty Three, and in this film The Bootleggers). In fact, I broke my "don't go see a movie alone" for the first time since Eyes Wide Shut to catch a 9:25 showing the night it opened. While I used my employee ability to see it for free, believe me when I say I would have paid to watch Lawless. With that combination of director and writer, a story (based in fact) about three brothers who bootleg alcohol during prohibition and the cast they'd lined up, I wasn't expecting to be disappointed. The Bondurant brothers: Forrest (Tom Hardy), Howard (Jason Clarke), and Jack (Shia LeBouf) distill moonshine in Franklin county, Virginia, the "wettest county in the world" and business has been good to them. The brothers are the stuff of legend around Franklin county, in large part because Forrest has the ability to survive injuries and illnesses that would kill any other man. His "indestructible" nature and propensity for speaking little and sudden, brutal outbursts of violence have the respect of other moonshiners, and keeps the unpredictable Howard and sensitive Jack in their good graces. Things change when the normally amenable local police come under the jurisdiction of Mason Wardell (Tim Tolin) and Special Deputy Charles Rakes (Guy Pearce) come in from Chicago and begin making demands, or else. Forrest decides not to play along, raising the ire of Rakes and ending up on the wrong side of a screwdriver to the throat. Jack, eager to prove he's strong enough to be a part of the family business, strikes a deal with Chicago gangster Floyd Banner (Gary Oldman) and keeps the Bondurants in business while his older brother recovers. In the meantime, Jack decides he wants to woo Bertha Mennix (Mia Wasikowska), the daughter of a local preacher. She takes a liking to him, but her strict religious family recognizes trouble immediately. The success of the Bondurant boys enrages the Special Deputy, and he reveals just how far he's willing to go to end the legend of Forrest Bondurant once and for all. 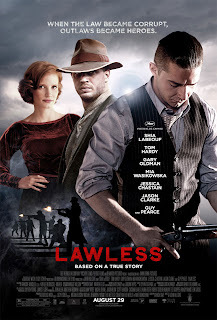 In a lot of ways, Lawless is a companion piece to The Proposition, and not merely because both are "period" stories; both films deal with familial bonds between brothers on the wrong side of the law and the consequences that can bring, albeit to different ends. Outside factors force the brothers to choose against their best interests in order to protect each other. If The Proposition is a "western" set in colonial Australia, then Lawless is a rural "gangster" film mostly without gangsters. Floyd Banner is a minor role, and while the boys do travel to Chicago to do business, if you're expecting something like Boardwalk Empire based on the chronological setting, prepare yourselves accordingly. This is more like Public Enemies by way of Matewan, but in a the best possible sense. Like The Proposition, it is a violent film, at times graphically so, and with that in mind I can understand why Roger Ebert considers it the kind of story that only deals with horrible people doing horrible things. From people I've talked to, Shia LeBeouf seems to be their concern as the "weak link" in an otherwise strong cast, but I have to say that as the weakest of the brothers, as the one who most desperately wants to impress Forrest, LeBeouf's Jack has much of Lawless to carry and does it quite well. You can understand what he sees in Bertha and why she's taken with him, even if the Bondurant reputation keeps her at bay. Speaking of which, Wasikowska has what should be the thankless "love interest" role and makes Bertha someone we care about, someone we worry for when Jack lets success get to his head. To be fair, Jack's success alongside Cricket Pate (Chronicle's Dane DeHaan) is born out of hard work, and when things go well, it's hard to blame them for celebrating and emulating the likes of Floyd Banner and Al Capone. Guy Pearce nearly steals the show as Charlie Rakes, the preening, squeaky-voiced Special Deputy with an affinity for brutality, matched only by his insistence on keeping clean at all times. Rakes wears one pair of gloves when beating Jack and another for when he chooses to use his gun. It's a greater insult to mar his face or mess his hair than to openly break the law, although it turns out there's one thing that Rakes hates even more than being disliked by criminals. With his shaved eyebrows and strange accent, it would be easy for Charlie Rakes to slip into caricature, to stand out too much from the rest of the cast, but Pearce always keeps him in check, a potent threat and not merely a joke of an antagonist. I realize I haven't even mentioned Jessica Chastain, who plays Maggie Beauford, a woman who left Chicago and came to Franklin county looking for work. She ends up in the gas station / restaurant the Bondurants use as a "cover" for their business, and like everybody else in Lawless, her history is far more complicated than one might suspect. Chastain has more to work with than Wasikowska as a character, and I was pleasantly surprised that despite what and who Maggie knows that her character's development is more than a plot device. There are a number of other recognizable actors in smaller roles that made me happy as the film went on: Noah Taylor (Almost Famous, The Life Aquatic with Steve Zissou) is Floyd Banner's right hand man, Lew Temple (The Devil's Rejects, Unstoppable) is one of Franklin county's deputies, and even Jason Clarke, the Bondurant brother who isn't as well known, has been memorable on Brotherhood and in Death Race, Public Enemies, and Wall Street: Money Never Sleeps. Okay, so clearly I haven't even mentioned Tom Hardy yet, who is the main attraction for most people who don't know who John Hillcoat is. After The Dark Knight Rises, he's on everybody's radar, and while I'd love it if more of you would go back and watch Bronson, Layer Cake, Inception, or Tinker Tailor Soldier Spy, I'm happy you're going to see Lawless because he's in it. And disappoint Hardy does not: Forrest Bondurant is mostly silent, and Hardy finds ways to diminish his size under baggy sweaters and an oversized fedora. When Forrest speaks, he often begins by muttering or making a noise that feels less like an acting choice and more like an appropriate reaction to he's just heard. There's a great scene near the end of the film between Hardy and Chastain that suggests even Forrest can't separate the legend from fact about his life. I mentioned before that Lawless is based on a true story, documented in The Wettest County in the World by Matt Bondurant, grandson of one of the brothers. The film closes with a picture of the real Bondurant brothers as boys, and gives greater context to Jack's narration during the film, one that rides the line between the myth of the family and the reality as it moves forward to the other side of Prohibition. Also adding to the film's slightly unreal quality is the choices in music (performed by Nick Cave and Warren Ellis, as well as The Bootleggers, Ralph Stanley, Willie Nelson, and Emmylou Harris), most of which are anachronistic to say the least. That said, while it's initially strange to hear "White Light / White Heat" or Townes Van Zandt's "Snake Song" in a film set in the 1930s, the lyrically appropriate choices don't distract in a way that, say, Moulin Rouge does. Only "White Light / White Heat" is immediately recognizable, and it appears more than once during the film in different incarnations. Finally, this may simply be the Cap'n alone on crazy island, but the climactic showdown of Lawless reminded me of the end of Porky's. That's not in any way meant to diminish my enjoyment of the film, or even to suggest that the two movies are in any way similar, but somewhere my loony brain made that synaptic connection. Go figure. Shia was good, Tom was good, but the one who really knocked this out of the park was Guy Pearce. Hopefully, just hopefully, he may get his first Oscar nomination for this but I almost highly doubt it since it’s a little too early to be calling out nominations so soon. Good review.